Hahli is the Toa Mahri of Water and the former Toa Inika of Water. A shy and diligent Ga-Matoran from Metru Nui, Hahli briefly served as the Chronicler of the island of Mata Nui. Under Jaller's leadership, she and four other Matoran mounted a rescue mission to Voya Nui and became Toa. When Gali's Nuva Symbol was stolen by the Bohrok-Kal, Hahli saw the Toa of Water summon a tidal wave, only for her to suddenly lose her powers. Hahli immediately set off to find Nokama and told the Turaga what had happened. The Toa Mahri managed to defeat the Venom Eel, and proceeded towards Mahri Nui. Upon arrival, they were attacked by the Matoran there, believing the Toa to be enemies. Hahli managed to convince the Matoran that they were Toa, and that they would not harm the Matoran there. While Matoro stayed behind, the other Toa Mahri proceeded to the Fields of Air, where they were asked to clear it of the Keras Crabs. When they reached the fields, the Toa confronted the Barraki, who imprisoned them in several sea caves. Hahli used her Kanohi Faxon to hypnotize the squid guarding her cave and escaped. Hahli joined Hewkii and Nuparu to explore the sea floor, where they came across a stash of Cordak Blasters that they shared with the other Toa Mahri. The Toa Mahri returned to the city, only to be attacked by the Matoran again, as they believed them to be allies to the Barraki. Hahli bid Kongu to push Defilak into the sea and swam around him quickly to pull away his personal air bubble, then threw him back into Mahri Nui, claiming that if she wanted to harm him, he would already be dead. Defilak then named the team the Toa Mahri. Matoro soon arrived and introduced Maxilos as an ally. The Toa departed from the city again to continue their search. Hahli saw Hydraxon attempt to destroy the Ignika and used a riptide to disrupt his shot. She dueled Hydraxon, but in the conflict, Mantax stole the Ignika and began to drain Hahli's and Hydraxon's life force. He bid them tell the other Barraki to meet with him at the Razor Whale's Teeth and left with the mask. Hahli rejoined the Toa Mahri and learned from Matoro that they must destroy the Cord, destroying Mahri Nui in the process. The Toa Mahri convinced the Matoran of Mahri Nui to journey up the Cord and return to Voya Nui. On the way, they were ambushed by the now-mutated Piraka. Avak used his prison power to imprison the Toa Mahri out of water, choking them, until Axonn knocked out both Piraka and Toa with an energy blast. After reviving, the Toa Mahri talked with Axonn, who took them to a cave holding the Toa Terrain Crawler. Hahli had misgivings about seeing a Rahi exploited in this manner, but the Toa Mahri still entered the Toa Terrain Crawler, which took them down to the waters of the Pit. Once in the Pit, the Toa Mahri split up. Hahli, Hewkii, and Nuparu spotted the Barraki battling Gadunka, who then attacked Hewkii. Hahli and Nuparu saved him and drove off Gadunka. The three Toa then reunited with their comrades, and prepared to destroy the Cord when Gadunka, the 300 Feet Mutant Venom Eel, and the Ancient Sea Behemoth appeared together to battle them. Hahli used her Faxon to become bio-luminescent, luring the Ancient Sea Behemoth into a trap made by Kongu. The Toa Mahri then destroyed the Cord, and followed Matoro, who had reclaimed the Ignika , with the Barraki and their armies right behind them. During their chase, the Toa Mahri each felt the impact of Mata Nui's death, and they decided that while Matoro made a final attempt to revive Mata Nui, the other Toa would hold off the Barraki and their armies. After an brief but emotional farewell, Hahli, Jaller, Hewkii, Nuparu, and Kongu turned and faced the Barraki, preparing to give up their lives for Mata Nui's life. Shortly afterwards, Annona attacked the fortress and consumed the dream energy of every Skakdi in the fortress, driving them mad. The Golden-Skinned Being's power automatically granted the maddened Skakdi's dreams, causing the fortress to dissolve and aberrations to appear in the region. During the confusion, the Golden-Skinned Being's hold on the Toa Mahri was broken, and Hahli was released from her trance. While a Toa Inika, Hahli's Water powers were entwined with Lightning. The lightning constantly crackled inside her, making her immune to the effects of Antidermis, and she could not create water without it having electricity laced in, though she could manipulate existing water without this problem. After becoming a Toa Mahri, she lost her lightning powers and was only capable of breathing water. [BL7] She also lost her ability to wear regular Kanohi, as her new modified Kanohi was necessary for breathing water. When Matoro teleported his team back to Metru Nui, he gave them the ability to breathe both water and air, making them amphibious[BL8] and allowing them to wear regular Kanohi. A Kolhii player, Hahli used a Kolhii stick as a Matoran, acquiring it after being selected for the team. She was also presented with the Chronicler's Staff after she was named Chronicler. As a Toa Inika, Hahli wore the Kanohi Elda, the Mask of Detection, which allowed her to find the Mask of Life and spot hidden beings, such as Matoro while he used his Iden. Hahli's tools in her Inika form were a Laser Harpoon, which could fire energy harpoons, as well as a Zamor Launcher loaded with Energized Protodermis. Her Zamor Launcher was lost when she transformed into a Toa Mahri. Hahli's mask is now a Kanohi Faxon, the Mask of Kindred. While underwater, she is unable to wear regular Kanohi, but can switch masks with the other Toa Mahri if need be. Hahli has been released three times as a set. She was first released in 2003 as one of the six small sets, which that year were the Matoran of Mata Nui in their rebuilt bodies. The set contained twenty-five pieces. The Hahli set had a gear on her back which could be used to move her from side to side. The set came with a Kolhii Stick and Kolhii ball. In summer 2006, Hahli's Toa Inika form was released as a 8728 Toa Hahli, containing 46 pieces. The set included a new rubber Kanohi, a Zamor Launcher, and a Laser Harpoon. The Laser Harpoon contained a battery-powered strobe light that could be turned on and flash for several seconds. Hahli could also be combined with 8729 Toa Nuparu and 8730 Toa Hewkii in order to create Toa Jovan. In a Nestle promotion in 2006, Hahli was released as a small promotional set under the name 6994 Blue Toa - Hahli. It consisted of 3 pieces which, unlike most other promotional items, were compatible with LEGO pieces. In August 2007, 8914 Toa Hahli was released, consisting of 59 pieces and depicting Hahli in her Toa Mahri form. She was the first Toa set of any element other than Air to feature lime green in her color scheme. Minifigure versions of Toa Inika and Toa Mahri Hahli were released in 2006 and 2007, respectively. Toa Inika Hahli's minifigure form was featured in 8893 Lava Chamber Gate, 8894 Piraka Stronghold, and 8624 Race for the Mask of Life, and Toa Mahri Hahli's minifigure form appeared in 8927 Toa Terrain Crawler. Hahli was also part of McDonald's BIONICLE "Happy Meal" promotion in 2006 and 2007. The Laser Harpoon of the 2006 Toa Inika Hahli toy would glow red when a button on the side was pressed. The 2007 Toa Mahri Hahli toy featured posable wing-like fins and talon claw. "You shall unite Duty and Destiny. You are the bringer. You are the Snowflake on the Mountain." "The one you love shall be destroyed!" "I'd tell you where you can go, except I think we're already there." "Insanity. 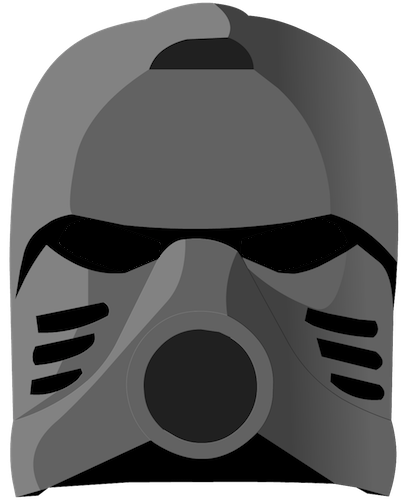 How can a mere Kanohi mask be worth so many lives?" "If you do not know its worth, then why are you here?" "I need that mask — the universe needs it — try anything, and I will personally show you the meaning of ‘dead in the water.'" "When did you become 'Hahli the Barbarian'?" "I am not of the Pit, I am of the sea. I learned the ways of water from Turaga Nokama and Toa Gali Nuva. The ocean shelters me, heals me ... and obeys me." "You know, Jaller always used to say that Toa were invincible, because the things they stand for — unity, duty, and destiny — are invincible. Oh, we had seen them injured, even defeated temporarily, but somehow they — we — always stood to fight again. Even in the worst moments, I thought surely we would win out and return home again. That's what Toa do, isn't it? That's what heroes do."